One Saturday years ago, a young Mark Frank begrudgingly spent his morning digging in the yard with his brother to fix a leaking water pipe. The family couldn’t afford to hire someone, and the house had no water. The two finished up digging just in time to play in an afternoon baseball game. They listened. Frank’s brother was slightly older, but both ended up earning bachelor’s degrees the same year as the first in their family to go to college. 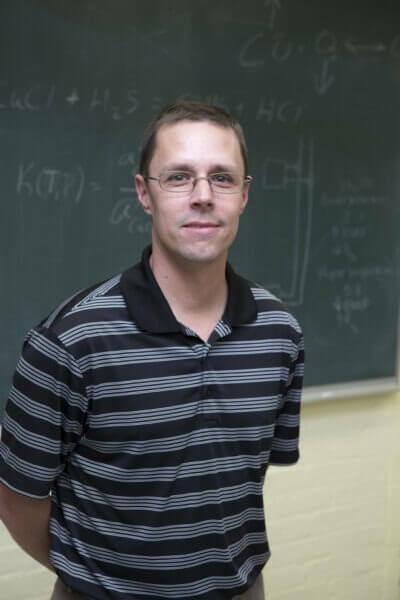 Frank, a professor in the Department of Geology and Environmental Geosciences at NIU, earned his Bachelor of Science from State University of New York College at Fredonia in 1994. He earned a master’s degree in 1996 and a Ph.D. in 2001 from the University of Maryland. Times were different for Frank’s parents growing up in the 1960s. His father went from high school to the U.S. Air Force to working as a jet engine mechanic, while his mother took jobs in retail. You could make a living without a college degree back then. While raising their sons, they saw economic decline. He’s thankful for that experience as it drove him through college. He developed a fascination with how things work, an understanding of what it would take to get him where he needs to be. Frank started out in electrical engineering, but changed his major after an organic chemistry class challenged him to identify unknown liquids and powders. He liked figuring things out on his own–basically, research. He also knew he’d want to teach one day. He didn’t have much money, but he made it work. Frank encourages students to find something they enjoy doing, perhaps even take classes outside their major to help them grow. A philosophy class he took in college still sticks with him. With less state funding for education, today’s students face a larger financial burden, often having to take out substantial loans and work to afford college, Frank said. “When you come to college as a first-generation student, I think it’s good to have your sights set on a goal, not just attend college, but think to yourself, ‘Where do I see myself?’ There are lots of us here that want to help,” he said.